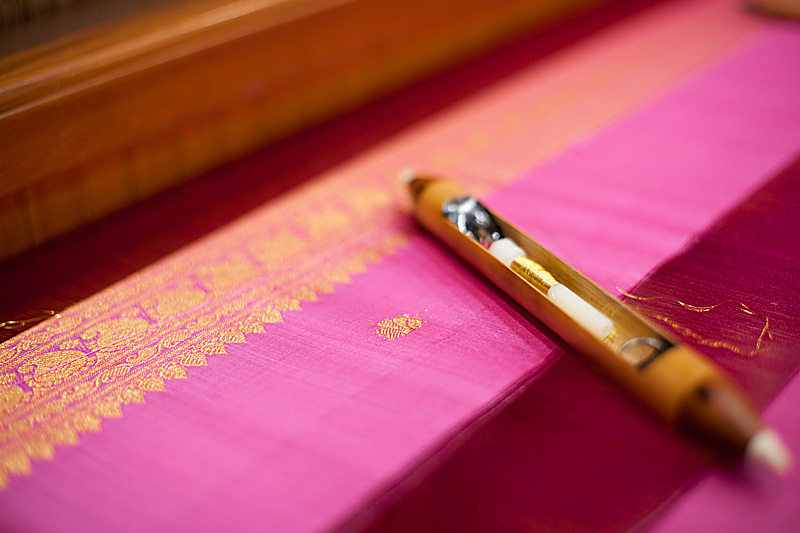 A shuttle rests on an unfinished silk saree. 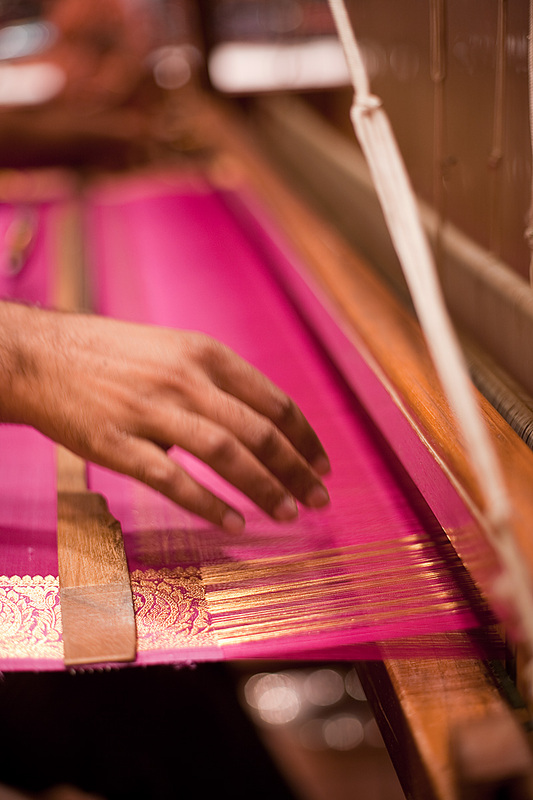 Seen here is one of the shuttles that is sent back and forth within the separated layers of a silk saree. 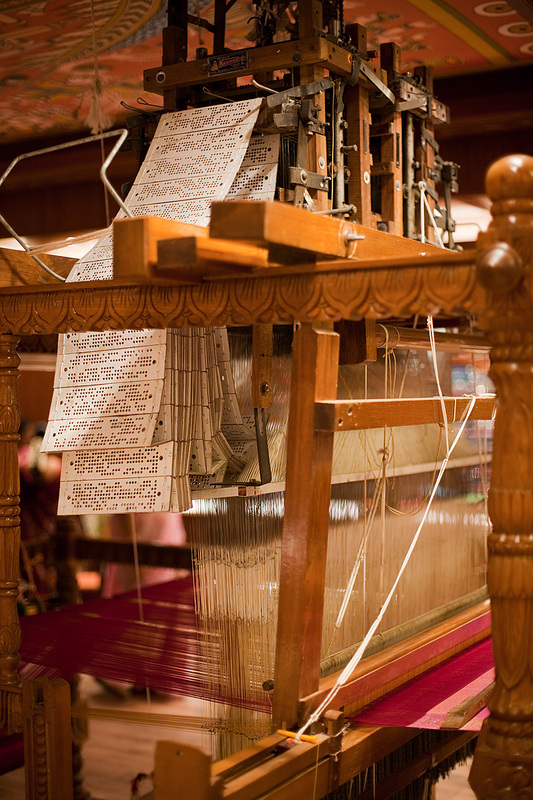 Currently the shuttle holds a gold fiber that makes up the intricate flowery pattern that is being woven at the moment. The coded key cards that are behind the intricate golden patterns. With each pass, a new key card is maneuvered into place which enables the line by line gold design seen on the saree body above. I won't begin to describe the functionality of the keycard's punched out holes except to say it's absolutely ingenious in the way it prevents certain pink threads from being lifted. You get an idea of how painstaking the initial setup of a saree must be. Each thread and each fiber must be individually tied to the correct line. One mistake can ruin the entire saree. The weaver's hand awaits an incoming shuttle. The intricate border design is seen in this photo. The keycards seen above control each individual golden thread either in the up or the down position. Absolutely fascinating!